Ever wonder how (or why) a Facebook page has a checkmark next to its name? It indicates that their Page has been verified by Facebook and is the official page representing the brand or person. That legitimacy it adds is nice and makes you look super-professional, but the really great part is that once your page is verified it will come up higher in Facebook search results.
. So you may want to adjust the “Category” of your page before proceeding (it’s in the About > Page Info > Category settings). 1A. Go to your page, click “Settings” at the top right, and then find the row that says “Page Verification.” Click “Edit” on the right side. 1C. Once you change your Category, it seems to work best if you then log out of Facebook and log back in. 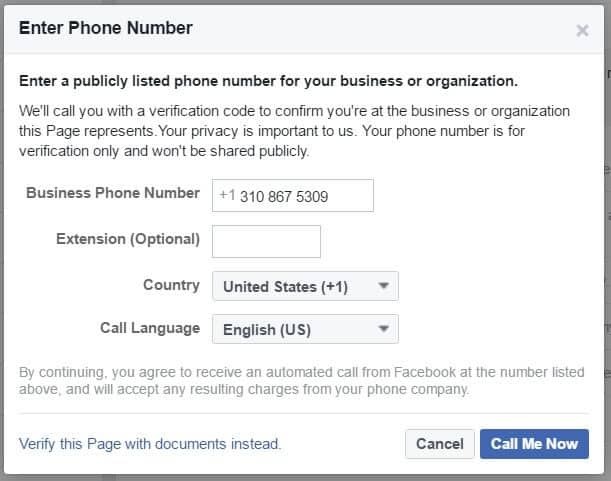 You may also need to verify your personal Facebook account by adding your mobile phone number. 2. Click “Verify this Page” and a popup will open asking you to enter your phone number. If you can get this step to work (it doesn’t seem to for most bloggers), it’s by far the easiest and fastest way to go. Enter your number, then follow the prompts to enter the verification code. 3. If the phone method doesn’t work, you’ll need to verify the page with documents instead. You can only upload one file at a time, so if you’re not sure what to send, it may be best to compile several documents into one PDF before sending. 4. You should hear back from them within a couple of days. In my case, they didn’t find the first round of documents to be sufficient — but I was able to go back and forth with them via email a few times until we got it sorted out. Once your page is successfully verified, you should receive an email notification like this one. Note the super-awesome highlighted part: “Show up higher in search results to help attract more visitors.” Hooray! 5. If you get stuck on the above steps, try using this form to request verification instead, as your site may be listed there as an option. Keep in mind you’ll need to be an admin of your page, and your page will need a profile picture, cover photo, and must meet (undisclosed) eligibility requirements, else it won’t be in the “Select Page” list on this form. What I have found is that the ability to verify your page depends on the category you have your page set to. 🙂 Any idea if you will lose your badge if you change your category after verification? My guess is that it won’t lose the verification — but that’s just a guess! The easy route didn’t work for me, but I did submit the documentation route. Cross your fingers for me and thanks for the post =] !!! The phone verification method hasn’t worked for any bloggers that I know of… hope the doc method works out. Keep us posted! Hi Andrew. I tried about 6 different categories (writer, author, blogger, public figure, food/cooking company) and none of them produced the setting to verify, even after logging out/back in, closing/reopening browser, super-reloading page. I could not find a category setting for either celebrity or media company. Suggestions? Update: I tried Brands & Products > Food/Beverages, which FB changed to Companies & Organizations > Food/Beverages, and the verification option appeared. No need to refresh, log out, or anything else. I’ve uploaded a document (didn’t accept my phone #) and we shall see. Hopefully this helps others to expedite the process. Thanks! Great! I’ll edit the post to suggest trying that one first. Thanks for suggesting it and providing instrux! Thanks for this excellent post Andrew. I’ll need to try various other types of documents they mention as I have none of the “official documents” they require. I’ll start with my driving licence (as they said that was OK, (on the form to request verification you mention above, but my site wasn’t listed as an option). Great – please let us know how it goes, and which document(s) they ended up accepting. Ok, finally got there Andrew. So we started with U.K. Drivers Licence, not accepted. Council Tax Utility Bill, not accepted. Credit Card Statement (which even has Facebook payments on it for Facebook adverts) not accepted! And finally Electricity Bill, this was accepted! WooHoo. I’m now verified! Yay! Glad you finally got verified — though it’s crazy how many documents they required and wouldn’t accept. This whole approval process seems very haphazard on Facebook’s part. Sigh. Andrew – It originally didn’t accept my phone number, but then I realized that I didn’t have a phone number listed in the About page! Once I edited that to include my phone number, it went through on on the first try. It does, however, add a Call Now! button on your page, which you will then have to remove manually. So far, it seems that nobody else has gotten the phone verification to work… So, just to be clear, you added your phone number to the “About” details, and then the telephone verification worked? Is the phone number you used also listed publicly as part of your business? Thanks Andrew. Super easy. My category was Author, so I used the link at the bottom of your post here, submitted my driver’s license, and heard in 2 days. Thanks! I have been wanting to get started livestreaming, so this will be great. 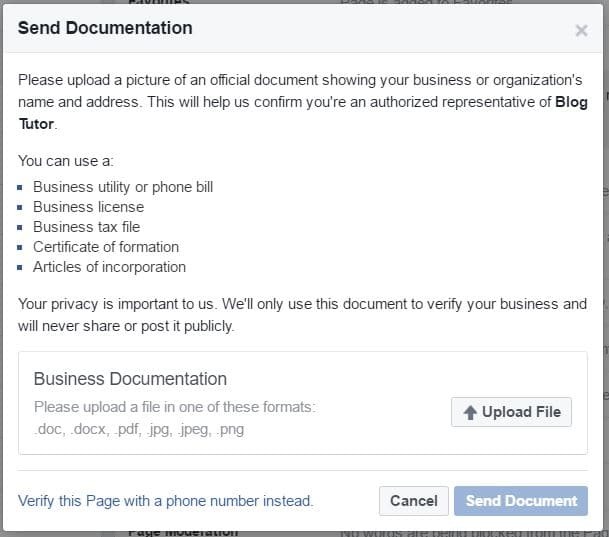 Facebook is only verifying brick n mortar business pages for those selling products. Meaning if you don’t have store front retail location and only run online business you will not get verified even if necessary documentation is provided. Unless something’s changed recently, that’s not the case. Both of my Facebook pages are verified, and I’m all-online. Hi there, I know this is an old post, but I was wondering how you won the battle on the DBA page. Running into this issue and they aren’t budging. :/ Thanks so much! I basically just kept re-submitting — though if I recall correctly, I may have included a cover letter, or added other supporting information each time… until whoever reviewed it finally accepted it (it’s possible a different person reviews each time, too – so that might be part of the inconsistency.). Wish I had a more concrete/useful answer for you… ah, the joy of the Facebook juggernaut! I managed to get only the grey verification badge. How can we upgrade to blue or is that in the hands of the Fb gods? Has anyone changed their category back and kept their badge? I think blue is supposed to be for people, and gray for brands, but they’re inconsistent about it. It shouldn’t matter, though, in terms of the net result (other than the fact that the blue is a bit more obvious). As for changing categories, I’m pretty sure you can safely change after you’ve been verified. Honestly after checking different articles about verification issue your explanation , FB say , must get a fix line not mobile phone to do verification . Moreover , i like to know , izit possible to verify my Chinese page not English name . I’m not sure what their requirements are in China. Here in the USA, I was able to use documentation to get verified instead of a phone number, so hopefully you can do that too! I run a blog/entertainment website. I made it through a 3rd party website creator that allows you to link your Facebook page to it so that you can move content back and forth seamlessly. It also allows my blog followers who don’t use Facebook to connect with those who do. However it doesn’t allow me to link it until my Facebook page is verified. Not only is the verification option not there, but neither is the “change category” option. I can’t get the verification option without changing the category..but I can’t change the category. I tried contacting Facebook via email about this and they said they can’t do anything for me, to just recreate the page with the category I want. I don’t want to do that, I’ve built this page up and have a decent 30k followers on it. I understand that isn’t much compared to other pages but I love my followers, I’ve built an awesome community and a platform for myself & others. I don’t want to delete it. If you could help me out on this, I would greatly appreciate it. If you don’t see any of that, I’d suggest contacing the 3rd party software vendor you mentioned – maybe they can help? If the process is denied, try to add your business maps to your about section. How is it possible to get the Page Verification (for blue badge) to show up for a Public Figure? Yes it just appears that there is no option. In other words, there is no link to even attempt to verify under Settings. Are you able to change your category? You may also need to log out and log back in. I have tried to get my page verified many times. I have sent many documents and get rejected every time. Is there someone at facebook to speak with to figure out why I keep on getting rejected? I sent them tax documents, articles of incorporation, utility bills… Very frustrating! Please someone help!! (and the above link of “try using this form to request verification instead” is broken).